Exploratory workshops are thematic workshops to gather relevant experts in a specific topic, who will present and discuss their findings to other experts and stakeholders (end-users, policymakers and industry) as well as identifying knowledge gaps in a particular theme. The expected outputs include planning of joint or cofounded joint calls for proposals in a specific topic, their focus and urgency (i.e. when the call should be launched) and further elaboration of RDI needs. These workshops would typically take place before the joint call activities. Read more on the 2016 Exploratory Workshop on “Closing the Water Cycle Gap” and 2017 Exploratory Workshop on “Improving Ecosystem Sustainability and Human Well-being”. indicative requested budget: up to €1.5 million. These joint calls will promote multi-disciplinary work and encourage proposals with fundamental and/or applied approaches, stimulate the mobility of researchers and research infrastructure sharing within the consortia, and enhance collaborative research and innovation during the project’s life and beyond. Networking workshops will be thematic one-day workshops to foster an exchange of information among the projects, finding synergies and means of collaboration, discussing how project outcomes can be targeted at stakeholders and exploring the formation of future consortia. These workshops typically follow joint call activities. They will also contribute to the strategy activities of the Water JPI. Read more on the 2016 Networking Workshop on “Emerging pollutants”. Knowledge hubs are thematic networks consisting of selected research groups within a defined area of research targeted at stakeholders. These knowledge hubs are typically set up following joint call activities. They also contribute to the strategy activities of the Water JPI. In addition to improved communication and networking with stakeholders and the scientific community, the added value of the knowledge hub instrument includes establishing a critical mass of research and technological excellence, integration and sharing of knowledge, infrastructures, data and modelling tools, training and capacity building. Read more on the first Water JPI Knowledge Hub on "Emerging Pollutants"
Thematic annual programming (TAP) consists of coordinated national calls. Each participating funding organisation would include the same topic in their own national calls. A percentage of the national project budget (7–10% of the total budget) would be dedicated to networking activities with the other projects funded under these coordinated calls in the participating countries; other relevant national projects that are already on-going could also be included. Coordinators of the selected projects will have to participate in annual working meetings to exchange information on approaches, methods, data (exchange) and results. This instrument will also contribute to the strategy activities of the Water JPI. The added value includes developing synergies, international cooperation and coordination between the individual projects and this should lead to a greater impact at the European level as well as to creating critical mass, addressing research gaps and avoiding duplication. 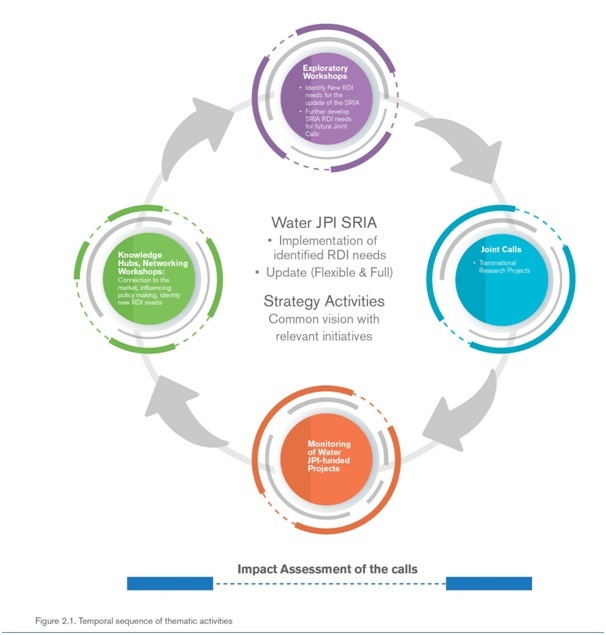 Strategy activities on a specific SRIA theme will aim to prepare a common vision between the Water JPI and other relevant initiative(s) in that specific area. Dedicated workshops will be organised. Read more on the first Common Vision workshop between the Water and FACCE JPIs.